How to scan a document in the Stylus Photo TX730WD printer, follow the steps below, you will see even more options to help you scan for different methods. 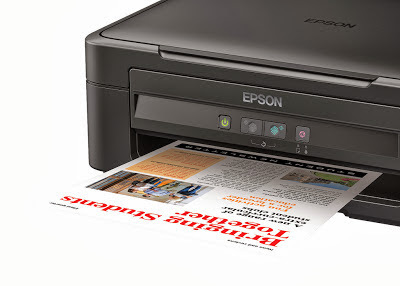 To scan in printers Epson Stylus Photo TX730WD we can do it in three ways, one is using the program officer scanning (Epson Scan), the other is from the printer panel and finally an independent external software from Epson. Epson Scan is the most recommended for the options you can give us, as you know it is the same printer manufacturer and is optimized for it. To run from the panel of the printer must be installed on the computer Epson Scan, if you want to use with an external scanner software it will require that the printer is functioning properly without any error. The following options appear available to scan in which we select our preference. Will require a configuration before scanning directly to the computer, you asked to tell the type of configuration or connection he has done with the computer. If the printer is connected via a USB cable, select USB connection. If the printer is connected by a network, select the name of the computer. Finally press start to begin scanning. First of all you must install this software on the computer, this printer comes with an installation disc, the program is on disk. Otherwise you can go to the manufacturer's website and make direct downloading, can help our publication as download drivers from the Epson website. 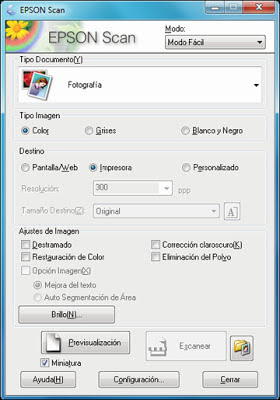 As you can see in the picture are all available options for this software, you can get more information in your manual, document that came with the printer when you buy it. There are many ways to scan a document, you only have Windows installed correctly and recognize it as a device for scanning printer can help some of the following posts related to scanning, you can use all this equipment. If you need help write a comment, gladly soon you have a rapid response and that will solve your problem.